To reduce exploration and production costs and risks in subsea oil and gas systems, Magma Global Limited has developed flexible m-pipe technology. Their latest lightweight continuous pipe is both the largest and longest Victrex PEEK-based structure ever, achieved with the support and expertise of Victrex. It can be deployed to depths of 10,000 feet (3,000 meters) and handle pressures of up to 15 ksi (103MPa). 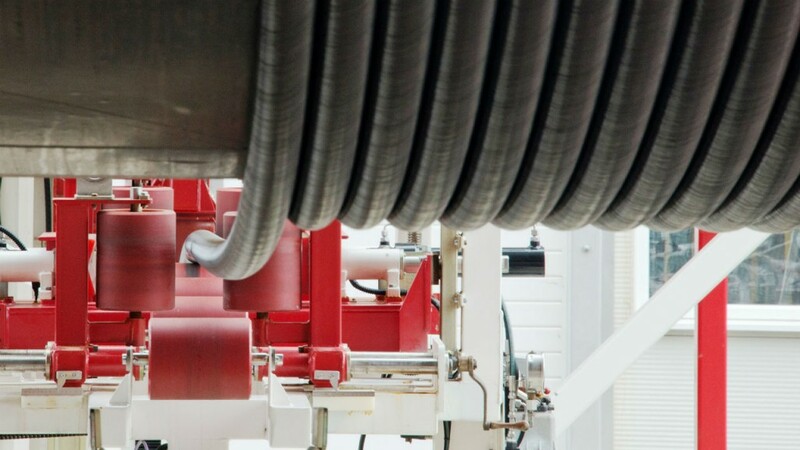 The composite pipe combines PEEK, high-grade carbon fibre and S-2 Glass fibres to form a reliable subsea intervention line that meets the demand for a hydraulic pumping system that can handle high pressures and high flow rates. Magma is offering its m-pipe and integrated deployment package as a vessel back-deck system for rapid hydraulic light well intervention. The Magma deployment system has a modular reeler with m-pipe intervention line pipe handling system, built-in tensioner, level wind, controls cabin, hydraulic power unit, installation platform and winch, for rapid pipe deployment and retrieval. The m-pipe is a composite material based on VICTREX PEEK polymer, carbon and glass fibers that delivers low fatigue, improved buoyancy in fluids and high resistance to corrosion compared to steel pipe. “Victrex PEEK-based m-pipe and deployment system offers regular, reliable low-cost hydraulic well intervention, and can be rented as a complete deployment package from Magma, on either a short-term campaign or annual contract basis. The m-pipe reduces the cost of intervention at a time when the oil and gas industry is extremely challenged on operational costs, and is also striving to achieve efficiency and reliability. The Magma system is designed to minimize mobilization time and maximize vessel utilization by reducing hydraulic pumping time, reducing intervention costs by up to 30%,” says Tavner. Magma’s ‘integrated package’ approach provides the ability to intervene in subsea completions continuously and efficiently, to maximize their ongoing productivity. The Magma system and high performance m-pipe allows for flexible high pressure and high-flow-rate pumping of intervention fluids into subsea wells from small vessels.